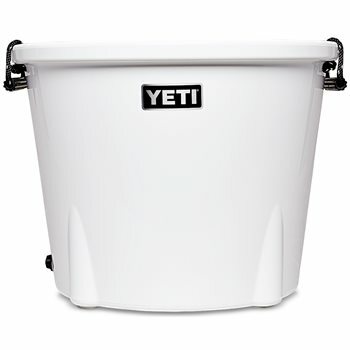 The YETI Tank 85 is a beverage tub that’s perfect for your next BBQ, tailgate or party. With a whopping 20.8 gallon capacity, this ice bucket is capable of holding 60 bottles, 96 cans or 1 keg, all while keeping your supply frosty with its Permafrost insulation. The Doublehaul Handles are made of a military grade nylon rope making it easy to transport your Tank to be the center of attention. The Tank was designed will all the same features that made other Yeti Coolers popular like the Rotomolded Construction, Bearfoot Non-Slip Feet , No Sweat Design and the Vortex Drain System. 25 1/2"W x 19 1/2"H.